I flew into Austin for SXSW on Saturday morning, a day behind everyone else. This created a situation where I had to scramble to pick up my badge, my press pass and get my lay of the land. I wasn't able to attend a single session on Saturday because time simply ran out. I did run into about 10 people I knew in my first hour I was here; friends from other conferences, from my former life, and various other places. The highlight was running into John Geletka who moved to LA last year and I had no clue he was going to be here. SXSW is turning into some great reunion of sort; bumping into virtual friends for the first time and seeing old IRL friends I have not seen in months. Nicole, Tony and I had dinner and headed out into the wild around 8pm. Unless you're on the "VIP" list for these parties it is almost impossible to get in. The lines are obscene and simply unacceptable for any self-respecting, bourbon loving, blog writing, wanna-be digital marketer. And particularly, for this former nightlife princess, waiting in line was not an option, so I started my own party. I called it a "snowball party". We were standing on a corner looking at the grotesque line for the Frog Digital party when we met Scott, a mobile app developer and SXSW veteran. Scott informed us that another party was going to start in an hour and if we headed over in that direction now, we could get in line. 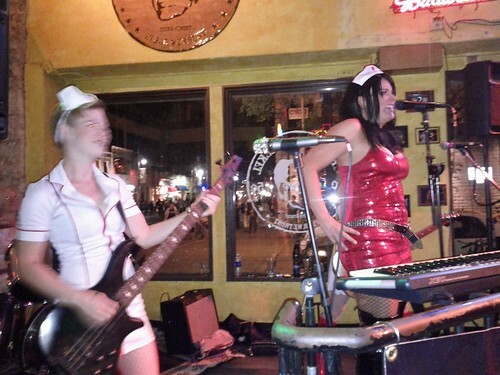 As we started walking down 6th Street, we found a way better option - The Thirsty Nickle had an all girl cover band dressed as naughty nurses. This is where we lost Nicole but gained Gerrard, a digital marketer for a large, traditional publication company - the snowball is growing! The band was awesome! The band wrapped up just as we received a text from Kim Redd, she was at the Foursquare party. Tony and I headed out with our new friends, Scott and Gerrard, to see if we could get into the Foursquare party. Snowball party in full force. The Foursquare party was great! It was like watching my Twitter stream come to life at that party. @Scobelizer @TristanWalker @Naveen just walking around - not just their avatars floating past my stream. The party was mostly filled with Amex executives, social media gurus and tons of mobile developers. That was the cool party, I met REALLY GEEKY developers. But nothing could top what happened next. As I was walking to washroom, I walked past one-lone Asian man standing on the dance floor, so of course, I approached him. He was wearing a custom-made button from Foursquare. I asked what that was, and in very broken English, he explained to me that Foursquare had made him the button because he was the biggest user in South Korea. Foursquare flew @Edit_King into the U.S. for this party! He was so happy to be in the United States and he was so happy to be in Austin but he was alone...until he became part of our snowball party!! I asked @Edit_King to explain further. Apparently, with over 60K check-ins, he was the biggest Foursquare user in South Korea. To put this in perspective, I am a Foursquare user (power-user IMO) and I have about 1200 check-ins. living vicariously through you. thanks woah 60k checkins!? that dude is insane! Love the part about @Edit_King! Naturally, I went straight to his twitter profile and started following him...although I may never know what he's actually saying.